High performance fire survival data cables manufactured by Draka and design to continue functioning even in the event of a fire. The twisted pair cables provide high data transmission rates and have been developed to mimic Cat-5 cabling as closely as possible. Its popularity is increased with system integrators for BMS applications, the cables can be terminated using traditional LAN Insulation Displacement Connectors (IDC) making them ideal for use in horizontal backbone wiring systems in offices and public buildings. 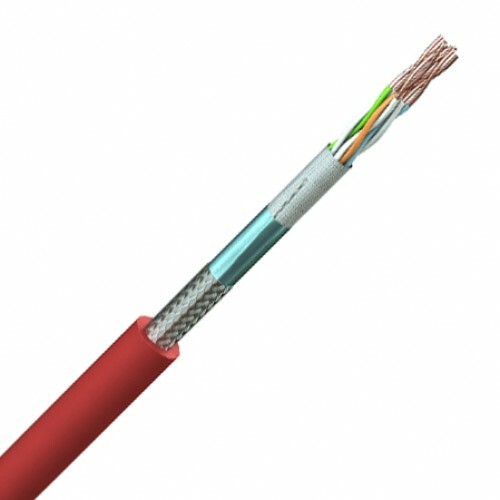 22(1) AWG solid plain copper conductor, PE/silicone rubber composite insulation, cores twisted into pairs, pairs laid up, woven glass tape, aluminium screen in contact with stranded tinned copper drain wire, tinned copper wire braid, Low Smoke Zero Halogen sheath, red colour. 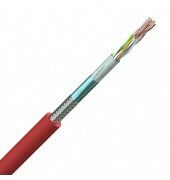 These cable was design generally to ISO/IEC 11801:95, EN 50173 95 and EN 50288-2-1, Suitable for standard Insulation Displacement Connector L.A.N. sockets. RS-485 10Mb/s.